Ranchers facing post-Irma challenges, but recovery may take awhile for stressed cattle. Hurricane Irma caused some immediate damage to Polk County area farms and ranches, where owners and caretakers initially were kept busy repairing fences, damaged roofs, and culverts. But, in the long term, the most serious effects may have been to the cattle and their food supply. With grass being the main food source for cattle in Florida, what happens to it is pretty important. “If they don’t have grass, they don’t grow. They don’t breed, they don’t do well,” says Jim Allen, owner of the Bartow-based Lake Hancock Cattle Company, who indicates weeds have been challenging. Only time will tell the long-term consequences of Irma, which plowed through the area in September. But – if history is any indication – it could have a detrimental effect for three years. That’s what happened after Hurricane Charley in 2004, says Taylor. The bottom line is cattle can become stressed, just like humans. “It takes time to recover all of that and for cattle to get back on their normal cycle,” Taylor says. 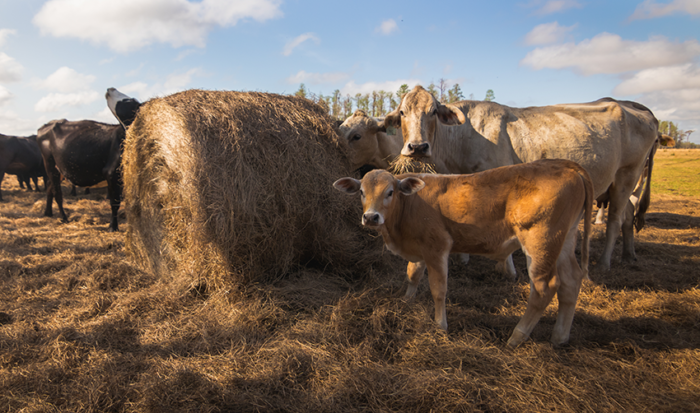 Florida ranchers typically raise calves that are sold to western feedlots in June through October. The prices they fetch depend on a variety of factors such as moisture levels, the amount of grass and the price of corn used by the feedlots to fatten the cattle for harvest. Larger loads of cattle of similar weight may be sold by contract through videos broadcast on television or through the Internet, ahead of time. It’s all based on projected weights and anticipated value and costs. Normally, they bring in a little more because there’s less stress involved than at sell barns. Individual or small groups land at sell barns, like Cattlemen’s Livestock Auction Market in Lakeland, where ranchers can sell smaller numbers on the spot. Co-owner Dave Tomkow says that, while this is a slow time of year, the numbers of cattle generally have been higher than last year. They have around 400 to 500 cattle weekly, instead of some 350 to 450 weekly. This year the market has rebounded and ranchers can survive. A good calf can fetch $700 now. “He’s got to be a good one,” Tomkow says. Sales at the 10 Florida markets were down on March 30, as compared to last year, according to the Florida Cattle Auctions Weekly Summary from the U.S. Department of Agriculture. Some 6,075 receipts were logged, compared to 6,577 a year ago. It was up from 5,201 the previous week. Allen, who also manages cattle for others, describes prices as “pretty flat.” “Prices are not as hoped for. We would have hoped by this time, the spring, there would be a little more demand to drive the price up,” he says. Still, there’s time for a correction. “There’s plenty of time for things to change,” he says. Taylor agrees. “It’s really too soon to tell how it’s going to affect our markets in Florida,” he says. In addition to funding repairs, ranchers have been faced with higher costs for things like labor, insurance, and fuel because it affects fertilizer and medicine expenses. Corn prices have not been exorbitant. But a good thing about cattle is that it can be sold year round when cash is needed. “When you need something, you can always sell a few. We don’t have to think about a [sales] window near as much as the blueberry people,” Allen says. Future cattle supplies depend on the amount of available land. And, with pastures being sold to housing developers, acreages are shrinking. “We’re losing cattle land every day nationwide,” Tomkow points out.